I don’t know about you, but sometimes it’s hard to know exactly where we need to go when trying to find answers about our bill, financial aid, or even help with registering for classes. Wouldn’t it be great if we could get all of these answers in one place? Student Central is that place! Recently, Student Central updated its website to make it more intuitive and easier for students and parents to use. The Student Central (or SCU) website is also easier to navigate now that there is an Ask Student Central search bar on the home page and wording that makes sense to all readers, not just those who already have experience with university finances and records. 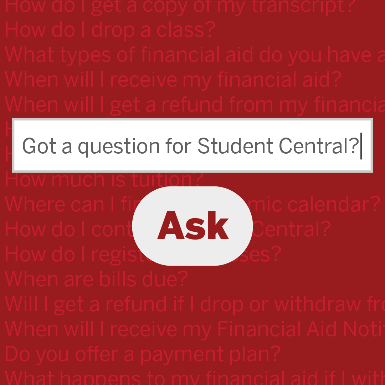 The best part is that the Ask Student Central search bar allows students and parents to seek help on any questions or concerns handled by SCU without having to search through multiple websites or wait in line to speak with someone on the phone or in person. Our time is precious and this just saved us a lot of time! Along with easier navigation, the SCU web site has improved by adding IU Bloomington’s tuition estimator and billing information so that it really is a one-stop shop for students and parents. SCU is the office students contact for billing, financial aid, and records information; and now their web site provides easy to access information on all three of these topics. The folks at SCU are always available to help by phone or email, but now the SCU web site makes self-service a bit easier for all of us. I am 22 years old and will be graduating in December with a bachelors of science in Chemistry and Math. I attended grade school in northwest Indiana and Crown Point High School later on. I currently work at Student Central in the call center answering questions on billing and financial aid. I hope to be continuing my studies in a graduate program fall 2017.